What a perfect gift idea to give to a relative, significant other, boss, client, or friend! 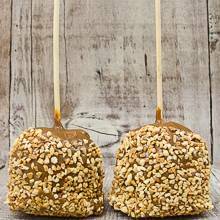 Our Caramel Apple with Peanuts Gift Pack incorporates not one, but two granny smith apples enrobed in our kettle caramel and smothered with finely chopped peanuts. Our apples come boxed in our deluxe apple boxes to provide adequate protection while shipping. Net Wt. 3 lb. 6oz. Ship Wt. 5 lb. From Denise of Vacaville, Unknown on 6/21/2012 .